Priced below Rs 100, the telecom company offers from 100 MBs to 2 GBs of data under these packs with a validity period ranging from one day to 28 days, according to its website. In a highly competitive market marked with aggressive pricing of mobile data, Bharti Airtel is offering many data recharge options below Rs 100 to its prepaid customers. Many of these recharge coupons come loaded with hundreds of MBs of mobile data, providing high flexibility in terms of validity period. For example, a 'Combo' prepaid recharge priced at Rs 9 by Bharti Airtel - which provides telecom services under brand Airtel - comes with 100MBs of data and 100 SMS for a validity period of one day, besides unlimited local/STD/roaming calls, according to the company's website - airtel.in. Bharti Airtel currently offers many small recharge packs. Priced below Rs 100, the telecom company offers from 100 MBs to 2 GBs of data under these packs with a validity period ranging from one day to 28 days, according to its website. 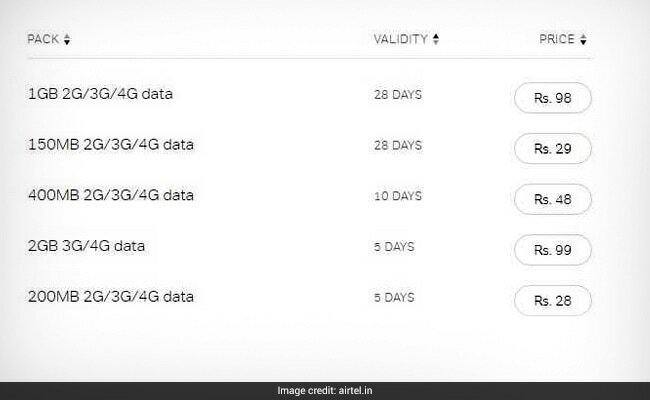 Under an internet recharge pack priced at Rs 98, Airtel offers 1 GB of data at 2G/3G/4G speed with a validity period of 28 days, according to the telecom company's website. In an internet recharge pack priced at Rs 29, Airtel offers 150 MBs of 2G/3G/4G speed data for a validity period of 28 days. 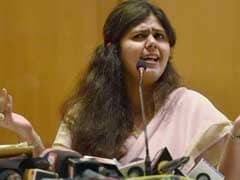 At Rs 48, Airtel offers 400 MBs of 2G/3G/4G data for a validity period of 10 days. At Rs 99, Airtel offers 2 GBs of data at 3G/4G speed for a validity period of five days in the internet recharge pack. In an internet recharge pack priced at Rs 28, Airtel offers 200 MBs of data at 2G/3G/4G speed for a validity period of five days. At Rs 24, Airtel offers an internet recharge pack in which it offers 135 MB of data at 2G/3G/4G speed for a validity period of three days. In an internet recharge pack priced at Rs 18, Airtel offers 100 MBs of data at 2G/3G/4G speed for a validity period of two days. At Rs 51, Bharti Airtel offers an internet recharge to its prepaid customers under which they get 1 GB of 3G/4G data for a validity period of one day. In an internet recharge pack priced at Rs 49, Bharti Airtel offers 1 GB of 3G/4G data for a validity period of one day. Bharti Airtel also offers several 'combo' recharge packs, offering a variety of benefits such as data along with voice calls, among others. Under a recharge pack priced at Rs 93, Bharti Airtel offers 1 GB of data at 3G/4G speed for a validity period of 10 days. Other benefits for the subscribers include free local/STD/roaming calls and 100 SMS per day for the entire validity period. At Rs 59, Bharti Airtel offers a combo recharge pack, in which its prepaid subscribers get 500 MBs of data and free local/STD/roaming calls for a validity period of seven days. The recharge pack also comes with 100 SMSes per day for the entire validity period, according to the company's website. 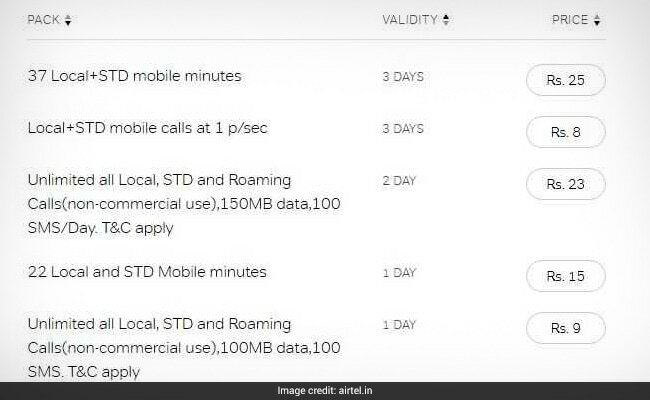 Under a recharge pack priced at Rs 23, Bharti Airtel offers 150 MBs of data, free local/STD/roaming calls as well as 100 SMS per day for a validity period of 2 days, according to its website. 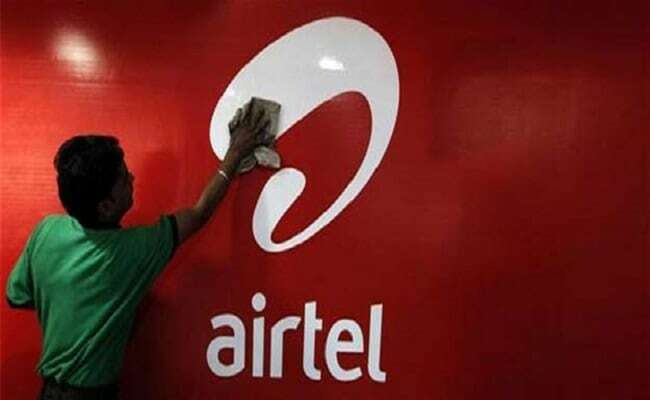 At Rs 9, Bharti Airtel offers a combo recharge pack to its prepaid customers. Subscribers, under this pack, get 100 MBs of data, 100 SMSes and free local/STD/roaming calls, according to the Airtel website.